Page 2 - KaBOOM! News | KaBOOM! April 30, 2015 Aisha Alexander, Director of Impact Innovation, KaBOOM! We here at KaBOOM! have been paying close attention to Baltimore, not only to the events in the past 24 hours or week, but throughout our years of community-building in the city. We have reached out to our partners throughout the Baltimore community over the last couple of days and are inspired by their efforts to put kids first. Thank you to Baltimore City Parks & Recreation, Druid Heights CDC and Jubilee Arts Baltimore for pulling in and hosting play days – a solid response for young kids who are probably struggling with what is happening. Your ability to quickly react to the needs of kids and families is awesome – they are hosting clean-ups and community forums, opening emergency meal sites, providing counseling, just to call out a few. As we strive to increase access to play opportunities for all kids, particularly those living in poverty, we press for the issue of equity to be taken into account in decisions and investments shaping the future of neighborhoods and cities. In the midst of crisis, whether it be a natural disaster or social turmoil, from a child's viewpoint, the situation is the same; a force much bigger than they are able to comprehend has altered their reality. As Playmakers work to restore some sense of normalcy in the short-term, as well as to bring a new reality for Baltimore in the coming weeks, months and beyond, we hope to be a thought partner in considering how community design and supportive services engage kids, and yes, give them the opportunity to play – a critical outlet to help mitigate stress, cope with emotional trauma and build resilience. We have long seen play and the work we do as a social justice issue. Over the years we have built more than 25 playgrounds in Baltimore and continue to work with key partners, like you, to address inequity in access to and investment in play opportunities. We are committed to helping to prevent the negative consequences on kids experiencing prolonged adversity. 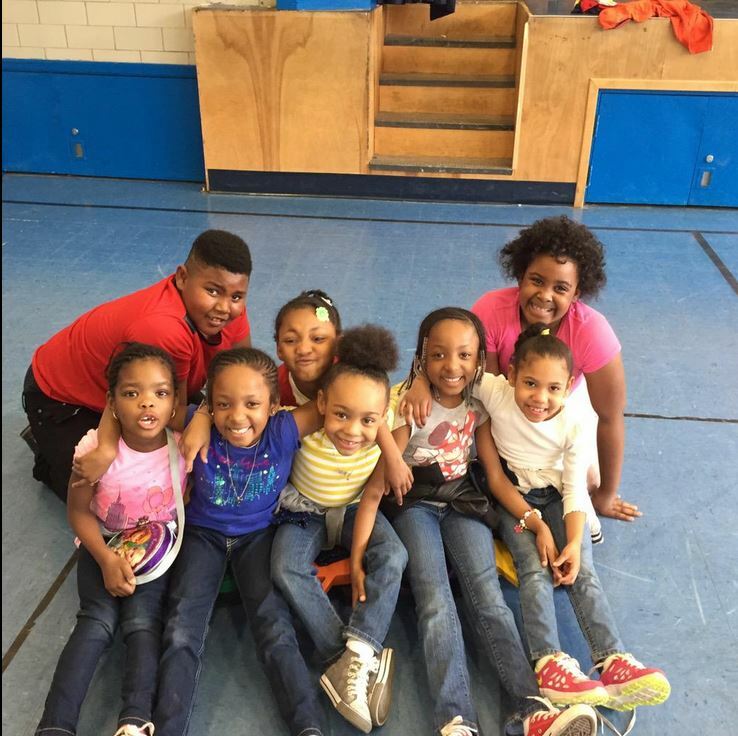 Because of Playmakers in Baltimore, there are two important factors in place for young kids: play and caring adults. Please know that as a committed partner in improving the lives of all kids, we value the continued effort and impact of our Baltimore Playmakers in the face of ongoing challenges. Their leadership inspires. We are staying in contact with our Baltimore partners to keep abreast of developments in the community, and we will provide updates as we think through how we can best be supportive. There is no one more vested in the future of our cities and neighborhoods than our kids, and we applaud all that consider them in their work. Last month, GOVERNING published an article that asked, "Do cities need kids?" As a dad of three living in the D.C. metropolitan area, I couldn't believe that such a question could even be posed. 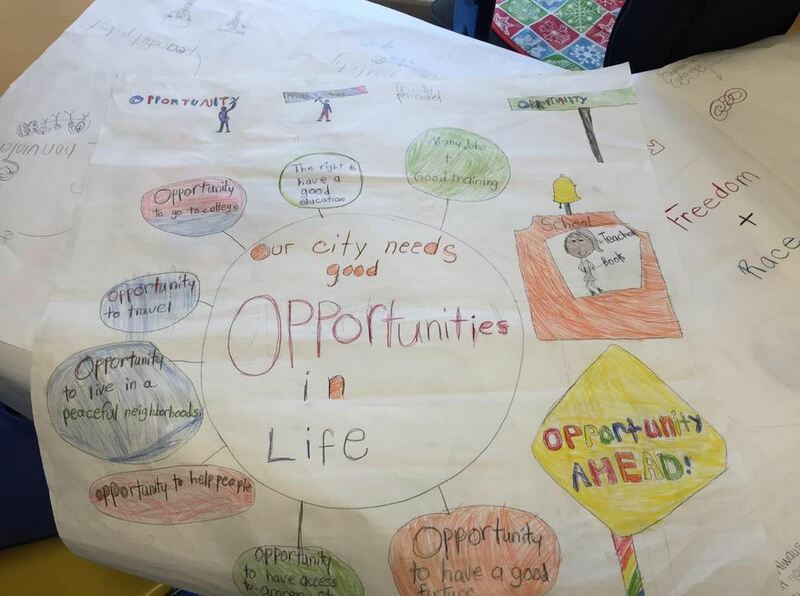 Our nation's future is inextricably tied to the future of kids in cities. The numbers speak for themselves. According to the most recent U.S. data, 80.7 percent of Americans live in an urban area, and contrary to popular opinion, the percentage of kids in urban areas is slightly higher. The question we should be asking is not whether cities need kids, but rather how cities can enable kids and their families to thrive. Skeptics argue that cities should focus on attracting young professionals without kids because it's easier to meet their needs. Washington Post reporter Lydia DePillis described the argument this way in an article: "Kids require schools, which can make up the biggest single chunk of a city's budget. They spend more time in municipal parks and recreation centers, and create problems that social services agencies have to help solve. Their parents save more for their kids' futures, rather than spending today, and buy food in bulk rather than going out to eat." Unfortunately, those who want to turn cities into childless playgrounds for young adults fail to distinguish between cost and value. Yes, it costs money to invest in good schools and parks, playgrounds, and other opportunities to play. But it also generates a significant return on investment – economically and civically. As Candace Damon, vice chair of leading urban development firm HR&A Advisors, made clear in The Wall Street Journal, when people have kids, their value grows in terms of spending power and taxable income and they are more engaged in their community. Cities that are among the best at attracting young professionals are increasingly the cities that make it difficult for families to stay. Developers are building more single-unit apartments and fewer places that can accommodate families. They are sacrificing playspaces for dog parks. These amount to a progressive's version of trickle-down economics: cater to young college-educated adults and hope that everyone else will benefit, too. It is simply unsustainable, both for our cities and our kids. Here in D.C., there is a groundbreaking bike sharing program and over 70 miles of bike lanes that make it easier and healthier for adults to get to work or get some exercise. But, as Courtland Milloy, columnist for The Washington Post, pointed out, "There are virtually none in Ward 8, by the way, which has the lowest income and highest number of children of any ward in the city." Don't get me wrong. I'm not against biking. In fact, I'm a huge proponent of biking and walking, and I agree that the creative class is a critical component of a successful city. However, I fear that rallying cries that call for "pedestrians first," "bikers first," or "creative class first" will only exacerbate inequity, particularly for the 13.2 million kids growing up in poverty in urban areas. If we want to create a sustainable future for the next generation, I propose an alternative rallying cry: "Kids First!" Everyone wants good jobs, safe neighborhoods, and affordable housing. In addition, families want – and kids need – great schools and abundant opportunities to play. Just as everyone – a new mom or dad with a stroller, someone carting groceries home from the corner store, etc. – benefits from accessible, ramped sidewalk curbs built to enable seniors and individuals with disabilities to be mobile, everyone would benefit from a city designed with kids in mind. At KaBOOM!, we are focused on ensuring that all kids get the balanced and active play they need to thrive. We know that play can transform kids from sedentary to physically active, bored to mentally active, and solitary to socially active. Yet only one in four kids gets the recommended 60 minutes of physical activity or active play per day. America's kids are playing less than they ever have before and are increasingly unhappy, unhealthy and falling behind: one in three kids is obese or overweight and one in five kids has a mental illness. Moreover, kids are not developing critical 21st century skills – such as collaboration, creativity, problem-solving, resilience and empathy – that they will need to succeed as adults in the global economy. Kids growing up in poverty face many barriers to play. They lack access to safe places to play, are more likely to attend schools that have cut back on recess, and spend an inordinate amount of time in places and situations that do not encourage active play. Cities across the country are beginning to make great strides in creating communities that foster walkability and bikeability. Now it is time for cities to put kids first and embrace Playability, making it easy for all kids to get the play they need to thrive. This can take many forms – Chicago extending the school day to ensure all kids get recess, physical education, arts, and culture; Brownsville, TX closing streets to cars in order to enable kids to play; or Baltimore turning moments of frustration into moments of joy by integrating play everywhere into routine places like bus stops; to name just a few. These cities recognize that play is not only good for kids, but also a competitive advantage for attracting and retaining families across the socio-economic spectrum who pay taxes, attract businesses, and care about the health and vitality of their community. During last week's Partnership for a Healthier America Summit, leaders across all sectors echoed the urgency to meet the needs of America's kids. During her remarks, First Lady Michelle Obama reaffirmed that we need to "give all kids every chance to reach their potential." We can meet this challenge at scale by creating thriving cities that give all kids the play-filled childhood they deserve. Last week, New York Times columnist David Brooks underscored the importance to our nation of expanding opportunities for underprivileged children, highlighting recent efforts to promote human capital development. Brooks argued that while academics, especially during the early developmental stages of childhood, are critically important, more emphasis needs to be placed on building social and emotional skills. Brooks contended that we won’t be able to expand opportunity for millions of students if they are unable to make good choices, build strong relationships, or persevere when faced with challenges. We agree with Brooks that preparing the next generation for success requires a broad view of child development. Through our work providing more and better play opportunities for low-income children in communities across the United States, we know that children cannot reach their full potential if they are denied the essence of childhood – the opportunity to play. Play is an essential part of the solution to expanding opportunities for low-income children because it leads to active bodies, active minds and active interaction together with peers, family and other caring adults – all of which are necessary for healthy child development. According to a report by the American Academy of Pediatrics, particularly for children who are faced with limited resources, it is essential that parents, families, schools and communities promote the lifelong benefits of play. The report notes that play helps children foster school engagement while enhancing their cognitive readiness, learning behaviors and problem-solving abilities, simultaneously aiding in the development of social and emotional ties. Simply put, play is a fundamental building block for the human capital development Brooks persuasively asserts is a critical national imperative. However, in low-income communities, where neighborhoods are unsafe and schools are cutting back on recess, children lack the opportunity to play actively every day. Whether it is on the playground, in the classroom or at home, we need to ensure that all children get the play they need to thrive. It is time to give children the childhood they deserve. Benfield answers yes—urban areas are increasingly unfriendly to children and this does diminish the greatness of cities. He also suggests that the solution includes investment in child-friendly infrastructure—playgrounds, parks, kid-friendly restaurants, and so on. 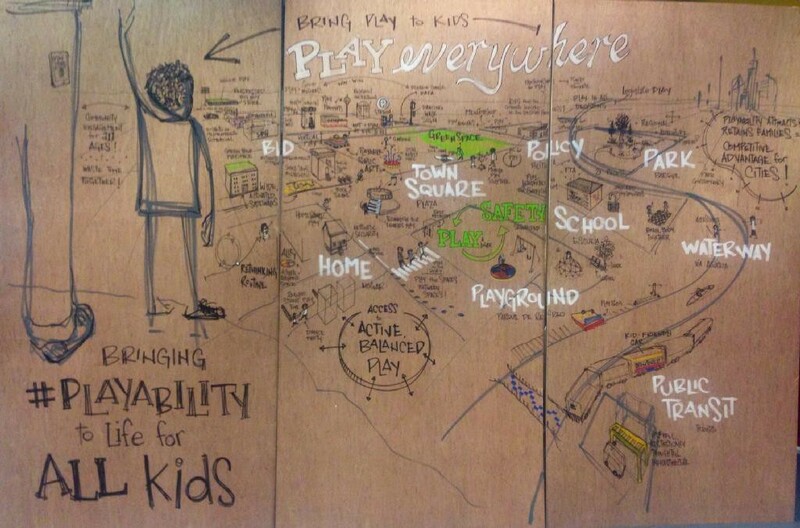 In other words, we need to create urban environments that enable children to play. We at KaBOOM! could not agree more. Childhood obesity is at record-high levels, childhood stress and depression is on the rise, and, economically, our demand for creative problem-solvers is out-pacing the number of potential employees with this skill. These challenges disproportionately impact children growing up in poverty, many of whom live in dense cities from Atlanta to Washington, D.C. Faced with this reality, and armed with the knowledge that play has been shown to make kids healthier, happier, and more creative, we’ve made it our bold goal to ensure that all children, particularly the 14 million American children growing up in poverty, get the play they need to thrive. As Benfield points out, there is growing momentum to increase walkability in cities across the country, as more and more people seek more active and environmentally-friendly lifestyles. Now is the time to accelerate the playability movement. There are encouraging signs from innovative cities that are leveraging underutilized resources and unexpected spaces in creative ways to make play the easy option for families—from play trails in Pierre, S.D., to Chicago, Ill., undergoing a holistic investment for play in schools and communities. Join us in creating truly great, playable cities where children play everywhere and can reach their full potential. “We've always tried to look for things that are innovative and creative, even though they tend to be a little bit risky—a little bit different. As long as they have the potential upside, we think it's worth doing. That's been a hallmark for the organization,” said Bruce Bowman, president of KaBOOM! during a recent interview on CauseTalk Radio. Joe Waters of SelfishGiving.com and Megan Strand of the Cause Marketing Forum hosted Bowman to discuss the new partnership with imagine toys and the Go Out and Play collection. It features items that enable kids to get the balance of play they need to thrive, promoting active minds, active bodies and being active together. Proceeds from the collection benefit KaBOOM!, while shoppers also have the option of adding a donation during check-out. More importantly, it generates awareness for the cause of play and introduces KaBOOM! to new advocates who also believe kids need to play actively every day. The project is a unique case-study in cause-marketing collaboration. “This is something different that an organization like yours is doing and I think we're going to see even more of it as the years go by because it does represent a really in-depth partnership,” said Waters. Listen to the full interview or browse the creative product line. Nearly every member of a community in New Mexico’s Navajo Nation came together to help build a playground not only to improve the lives of the 2,800 children who live there, but also, perhaps, to save them. The town of Thoreau, located about 100 miles west of Albuquerque in the red mesas of northwestern New Mexico, has been coping with a high suicide rate, ranging anywhere from nine to 29 per year—a big portion for a town with a population of less than 2,000. In addition to the high suicide rate, “unemployment rates are very high, poverty is the norm, and physical isolation is a major problem,” says Trudi Griffin, the principal at St. Bonaventure Indian Mission and School, a private, tuition-free Catholic school in the community. St. Bonaventure reached out to KaBOOM! for help building a place for children to play. Studies have shown play and physical activity is essential for the overall health, well-being, and happiness of children. According to the most recent issue of the American Journal of Play, “The decline of children’s play time has led to the rise of anxiety, depression, and problems of attention and self-control.” A recent quantitative study from Insight Strategy Group, commissioned by KaBOOM!, with the support of the Mattel Children’s Foundation, reports that parents and children both see play as a way to relax and get rid of stress. And for good reason—sometimes the most important thing to remember about play is its simplest definition: play is fun. 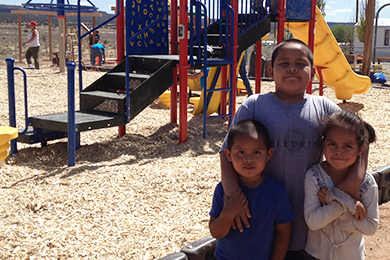 For this struggling community, a playground seemed to be just what the doctor ordered. To get the process started, St. Bonaventure took the initiative, filling out the application. But local parents also got involved. “Children have no place safe to play during the summer,” and “There is no place for young children to go to stay out of trouble,” parents wrote in letters to KaBOOM!. 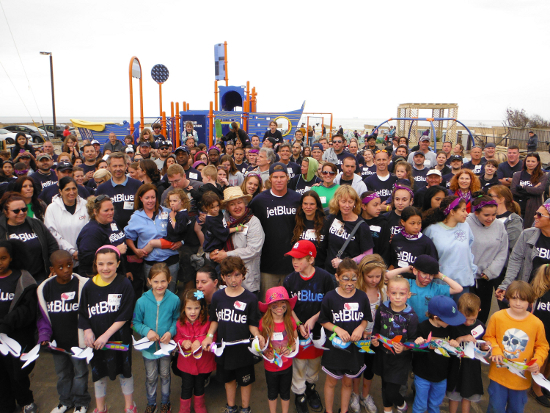 The final piece of the puzzle was put into place when Blue Cross and Blue Shield of New Mexico (BCBSNM) stepped up to fund the playground, to “help New Mexico stay healthy,” said a rep from BCBSNM on the day the playground was built. Together, the community, KaBOOM! and BCBSNM assembled the 2,500 square foot playspace that features more than 2,000 ways for kids ages 2–12 to engage both physically and mentally. The site features slides, swings and learning panels, and can accommodate up to 60 kids at once. Parents and other adults can stand in shade cover, sit on benches or gather at picnic tables nearby while kids play—all elements that were built alongside the playground with the help of volunteers from the community. We hope this playground brings joy to the children and the adults of Thoreau for years to come. “Words cannot describe how grateful I am by all the work you all at KaBOOM! did for Long Beach. The new playground is fantastic and even better than before! I cannot wait for my little girl to be able to play there. In just a few more months, she'll at least be on the swing set! Again, thank you for everything. This project was definitely the best volunteering experience I have ever had." - Anthony Dalto, Long Beach, N.Y.
Hurricane Sandy struck Long Beach, N.Y., one year ago today, leaving an incredible path of destruction in its wake. Like many residents in the northeast, Long Beach residents lost their homes, their schools and their neighborhoods because of the catastrophic storm. Like many communities, Long Beach also lost one of the few places for children to play: Magnolia Playground. As many in the northeast would also determine, Long Beach residents realized that in the aftermath of such a monumental natural disaster that play becomes even more critical because it creates a sense of normalcy and provides an emotional outlet for children during a time of extreme stress. So, in addition to many homes and schools needing to be rebuilt, children needed a place to play. On May, 18, 2013, 242 volunteers from the Long Beach community joined with local organization Surf For All, the City of Long Beach, JetBlue and KaBOOM! to rebuild Magnolia Playground. In less than eight hours, volunteers built a child-designed playground that will serve thousands of children for years to come. 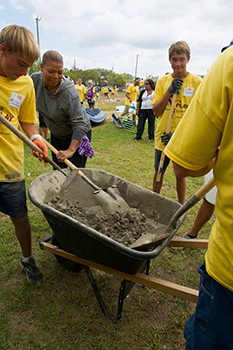 The Long Beach project marked the first of 11 playground builds to be built in 2013 directly by KaBOOM! and our partners, including BNP Paribas, Disney, Dr Pepper Snapple Group, Good Neighbor Pharmacy, JetBlue and UnitedHealthcare. 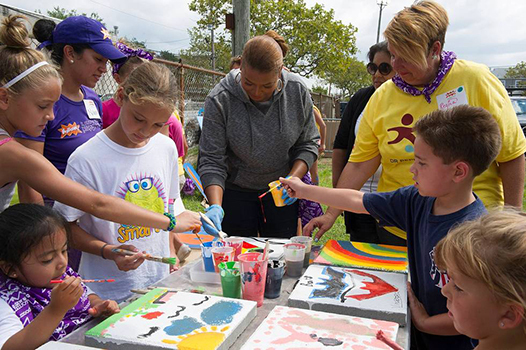 Even Queen Latifah pitched in to bring play to Sandy survivors. The last of these 11 playground projects will be completed on Saturday, when more than 200 volunteers will build a brand new playground at The Community YMCA Family Health and Wellness Center, which serves hundreds of children and families affected by Hurricane Sandy in Red Bank, N.J. These 11 playgrounds covering more than 27,000 square feet will eventually serve more than 30,000 children and will have been built by more than 2,500 volunteers donating more than 20,000 hours of service. Additionally, KaBOOM! partnered with Creative Circle, JetBlue and UnitedHealthcare to donate Imagination Playground to four child-serving organizations in the northeast following the storm. As tremendous as these projects are, our work is not done. There are still thousands of children in Sandy-affected areas and millions of children across North America who do not have a place to play. You can help KaBOOM! give children the childhoods they deserve by taking action to ensure that all children have access to a playground. 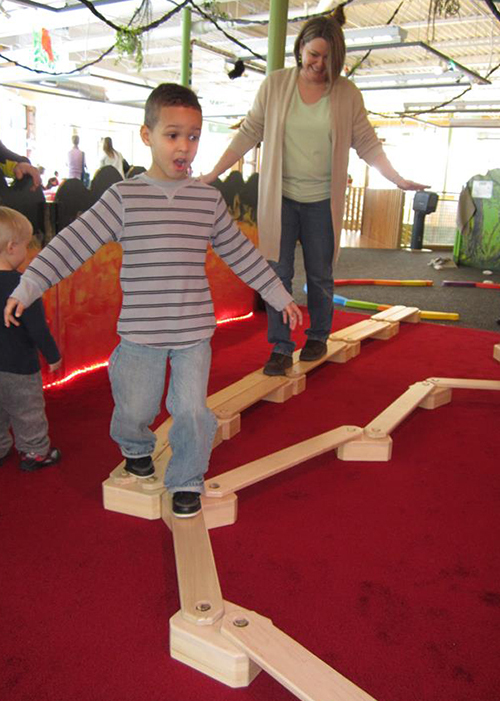 The Grand Rapids Children’s Museum (GRCM) celebrates childhood and the joy of learning by providing an interactive, hands-on environment that inspires learning and encourages self-directed exploration. In the heart of downtown Grand Rapids, Mich., a Playful City USA community, the GRCM has celebrated 16 years of play with over 2 million guests. Enjoy this guest blog post from the GRCM. Play is an essential part of life—specifically unguided, open-ended, free play. The kind of play that has no right or wrong answer: creativity and imagination without a specific end product. In other words, play for play’s sake. 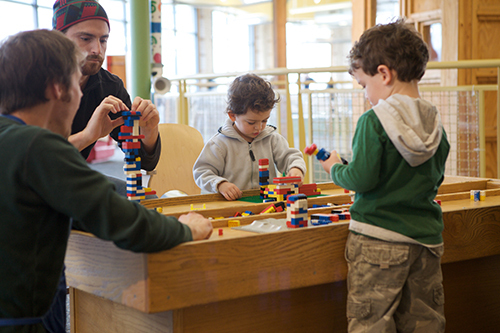 The Grand Rapids Children’s Museum (GRCM), located in downtown Grand Rapids, Mich., is committed to play and part of that commitment is giving our guests, adults as well as children, permission to play. Perhaps nothing demonstrates this idea more than the museum’s most unique exhibit: our staff. Our floor staff, or Facilitators do not direct play; they do not give specific instructions, but invite our guests, adult and child alike, to play with them. They facilitate play by asking open-ended questions (“What are you making?”), engaging in parallel play (playing along-side or near a child in a similar activity, but not directly with the child until they invite the staff member to join), or by simply asking if they can help with what the child is creating. This not only leads to very unique creations but also demonstrates some simple ways to continue playing at home. When the GRCM celebrated our 15th anniversary last year, we were fortunate to be able to share a new exhibit, Imagination Playground™, with the community. 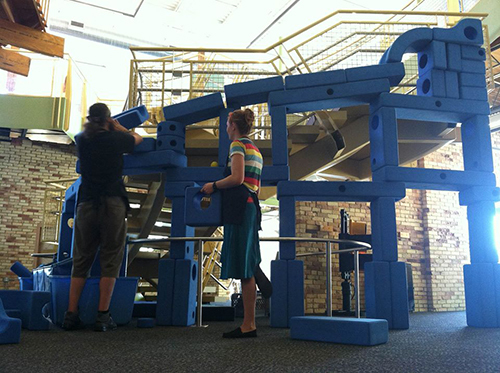 No other exhibit illustrates the concept of open-ended play as well as Imagination Playground™. It’s a wonderful catalyst for collaboration. 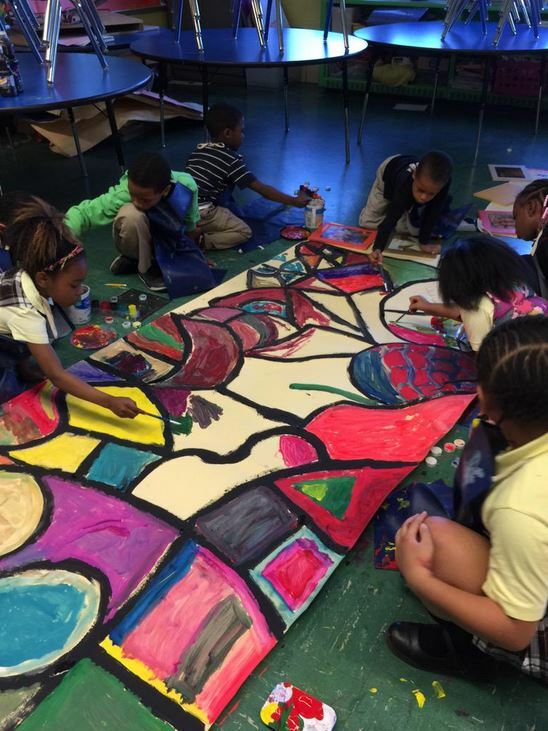 Parents and teachers immerse themselves in the creative experience with the children (and our staff). We often joke that our Facilitators have enjoyed Imagination Playground™ even more than our guests. Nearly every day, the office receives a call inviting the administrative team to come and see a new creation—a fort, a throne, a robot, a boat or two-story ball run—that the Facilitators and guests have made together. More recently, we were able to borrow a Rigamajig (formerly Workyard Kit), which is very similar to a large Erector Set, and were happy to see some even more elaborate creations. While we continue to provide a number of experiences and exhibits that would be difficult to replicate at home, one thing we do try to impart on our guests is how easy it is to play. In February 2013, GRCM launched a “What Can You Do With a Spoon?” campaign (see video below) to get people thinking about ways to play, even with items that normally wouldn’t be thought of as toys, and demonstrate how easy it can be to include some play every day. The enthusiasm and imagination of our staff inspires play. It invites museum guests of all ages to join in the fun, letting them share in the joy of making a giant bubble, the excitement of showing off a Lego airplane, the thrill of putting on a fire-fighter helmet and piloting a helicopter. But we strive for more than having fun while visiting the museum. We hope that their experience here carries over into their play at home and that they allow the kids in their lives to guide the activity. That they remember to ask open-ended questions like “What are you building?” “What are drawing?” We hope that our guests take with them the idea that play really is for everyone and that everyone, regardless of age, should take time every day to enjoy some play. You have our permission. For the first time, municipal and thought leaders from around the country gathered to chart a path to make sure that all kids get the play they need to thrive. Representatives from 53 cities, 30 states, and three countries came together at the inaugural Playful City USA Leaders' Summit, hosted by KaBOOM! and sponsored by the Humana Foundation, to declare loud and clear that they value play. The nearly 200 participants rolled up their sleeves and spent an intense two days on an issue that—thanks to the efforts of many at the summit—is gaining increasing attention. Participants engaged with an impressive list of speakers and presenters, including Secretaries Kathleen Sebelius and Arne Duncan, journalist Cokie Roberts, Walter Isaacson, author of the best-selling biography Steve Jobs, and 12 mayors, about how play contributes to positive outcomes for children and communities. From building 21st century workforce skills, to reversing the trend in childhood obesity rates, to renewing urban areas, investing in play is an investment in our future. "Cities are critical when it comes to achieving play-related outcomes because most play-focused infrastructure investment, policies, and programming happen at the local level," said Darell Hammond, Founder and CEO of KaBOOM!. "That's why KaBOOM! 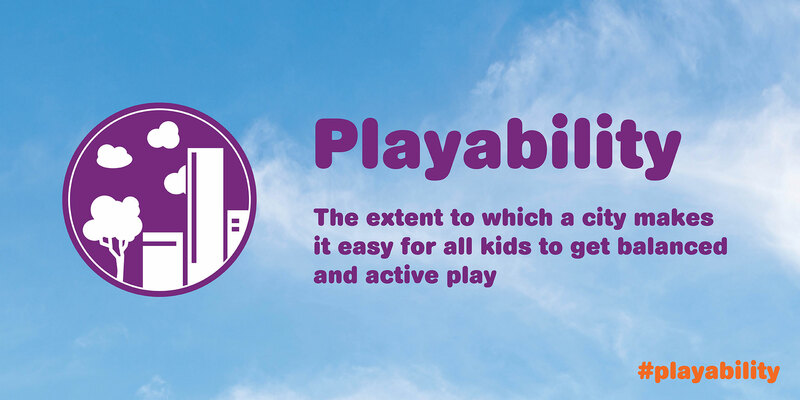 created the Playful City USA program in 2007 to recognize municipalities who are prioritizing play. It was great to have many of our Playful City USA communities at our inaugural summit." When Walter Isaacson said, "If you believe in education..." The Honorable Arne Duncan completed his sentence with "...you've got to believe in play." Pierre, South Dakota, showed how they turned a trail system into a multi-generational playspace by adding play pods along the trail. Health and Human Services Secretary Kathleen Sebelius noted that the medical community no longer uses the term "adult-onset diabetes," since it is now so common in obese children, then noted the physical benefits of active play. A team from the Playful City USA community of Providence, R.I., demonstrated how collaboration between non-profits and government is creating great places to play. Providence was one of 12 cross-sector teams from cities who were at the center of the summit. New research revealed that the reason most parents and kids cite for going to the playground is stress relief—which is critically important as we have a growing understanding of the near- and long-term effects of toxic stress. "At Humana, we believe in making fun things healthy and healthy things fun. The Humana Foundation is proud to be the official sponsor of the KaBOOM! Playful City USA Leaders' Summit, working hand in hand with those on the front lines of our nation' cities to create safe places for people of all ages to live and play together," said Virginia Kelly Judd, Executive Director, Humana Foundation. In closing remarks, best-selling author Wes Moore aptly said, "This is about more than playgrounds, monkey bars, and trampolines. It's about our children." The audience rose in thunderous applause and we couldn't agree more. The summit made clear that there is a growing movement to give all children the childhood they deserve by ensuring they get the active play they need to thrive. In an event fit for a queen, 229 volunteers from Dr Pepper Snapple Group, AmeriCorps and the local community near Seaside Heights, N.J., rallied together to build a brand new playground across the street from Hugh J. Boyd Elementary on August 27. However, this was no typical playground build. 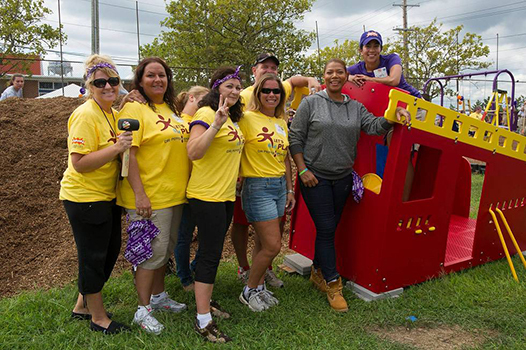 The volunteers and 167 children present for the playground build were joined by royalty: Queen Latifah! A New Jersey native, Queen Latifah knew first-hand about the devastating effects of Superstorm Sandy on Seaside Heights. 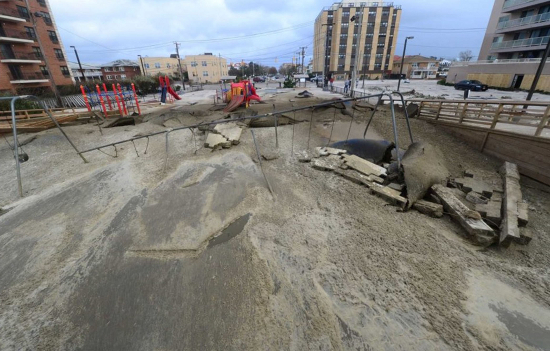 Boyd Elementary was severely damaged by the storm and its playground was rendered useless, leaving children in Seaside Heights without a playground. 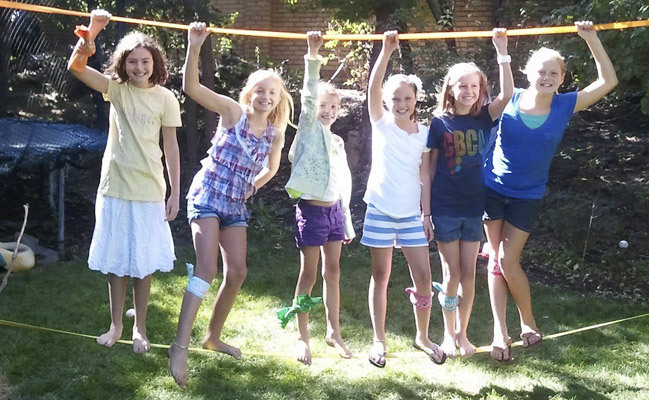 All kids need a balance of all kinds of active play every day to thrive. That becomes even more important after a traumatic event like Superstorm Sandy, because play helps kids process their emotions and gives them a sense of normalcy amidst the chaos. "We know how critical it is that kids are very active. It's critical to their development," said Queen Latifah. 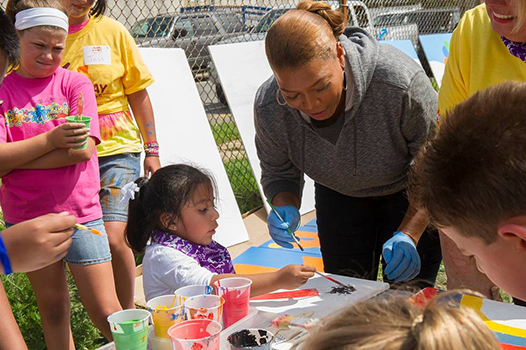 Committed to ensuring that children have a great place to play, Queen Latifah partnered with Dr Pepper Snapple Group and KaBOOM! to build a new playground for children in Seaside Heights, bringing along her show’s crew to document the build day. The segment about the Seaside Heights project aired on the Queen Latifah Show on October 15. The kids were thrilled when Queen Latifiah surprised them with an army of more than 200 volunteers ready to build them a new playground. 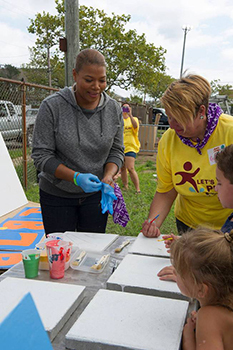 Queen Latifah herself jumped right in to help, assembling playground equipment. Emotions were high as this incredibly resilient community united to bring the gift of play to its children. The Seaside Heights project was part of the Let’s Play initiative—a community partnership led by Dr Pepper Snapple Group to get kids and families active nationwide. In 2011, Dr Pepper Snapple Group made a $15 million, three-year commitment to KaBOOM! to build or fix up 2,000 playgrounds, benefiting an estimated five million children across North America. Dr Pepper Snapple Group and KaBOOM! 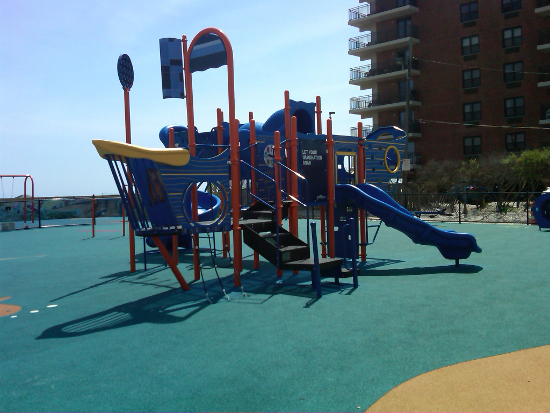 will continue to help this seaside town rebuild with another playground project on October 23, just before the one year anniversary of SuperStorm Sandy. Interested in having a KaBOOM! playground in your neighborhood? See what it takes to become a Community Partner.